"Portpatrick Holiday Homes" are a collection of holiday apartments located in the centre of Portpatrick, on the Dumfries and Galloway west coast. The apartments (called Iona, Skye, Jura, Bute, Islay) sleep from 4 to 7 people. Iona sleeps 6 people in 2 bedrooms. You have a king-size double (which can be converted in twin beds), and an additional bed. With the second bedrooms having 3 single beds. Pets are allowed in Iona too. Skye sleeps 4 people in 2 bedrooms. With both bedrooms being king-size doubles, which can be made into twin beds. Pets are allowed in Skye. Jura sleeps 4 people in 2 bedrooms. With both bedrooms being king-size doubles, which can be made into twin beds. Pets are allowed in Jura. Bute sleeps 7 people in 3 bedrooms - with the bedrooms being made-up of king-size double bedrooms. Although they can be twin-bedrooms if required. One of the bedrooms has an additional single bed. Bute is pet friendly. Islay sleeps 7 people in 3 bedrooms - with the bedrooms being made-up of king-size double bedrooms. Although they can be twin-bedrooms if required. Islay is pet friendly. All the apartments at Portpatrick Holiday Homes are pet friendly, which means those with a dog as part of the family can spend their day walking in this glorious landscape together. The apartments all have electric central heating, with your electricity, bed linen, towels and Wi-Fi included in the price of your holiday. There is a travel cot and highchair available on request. A welcome pack is provided. You have a courtyard with sitting-out area and garden furniture. If you want to bring your cycles along, there is a bike store. Each apartment has private parking for 2 cars; with additional on road parking. No smoking as permitted in the apartments. During your holiday you can explore all around this part of Dumfries and Galloway. Head south along the mull, and visit Port Logan with its fish pond dig into the rock-face. Then continue south to the Mull of Galloway, where you can visit the light house. Stranraer is 7 miles from Portpatrick Holiday Homes. This old port town has a choice of pubs, restaurants and shops, Drive on the eastern side of Loch Ryan, and you can easily get to Cairnryan, where you can catch a ferry for a trip to Belfast for the day. Portpatrick is a seaside town on the western shore of the Rhins of Galloway peninsula. The town is set around a small bay with cliffs as the backdrop. You can try your hand at sea angling; as well as walking - with a short stroll along the cliffs to Dunskey Castle. The Southern Upland Way starts here runs all the way to the east coast. 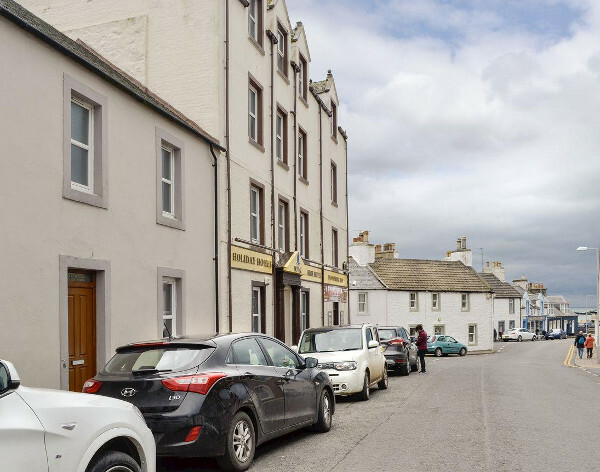 The nearest shop, pub and restaurant to Portpatrick Holiday Homes are all 50 yards away. Should Portpatrick Holiday Homes not be to your liking, but you fancy staying in the area around Dumfries and Galloway, you might well be interested in the cottages below. All these cottages are within a few miles of Portpatrick Holiday Homes.